It is not known just when the Atoka school started, but some of the early settlers thought it started in the mid 1870's. Rev. R.F. Mitchell who arrived in Atoka community in 1882 said there was a building at the Atoka Cemetery in the 70's. Most of his children went to school there and are listed on the school roll for 1889 - 1890. Rev. R.F. Mitchell, D.A. Parker and James Hill are listed as trustees. There were 81 children listed on the school roll, which Pro. Wm. C. Rickard kept. Rickard was an early day teacher in Coleman County and was known as an outstanding teacher. A former Atoka student, Sally Weaver, who later married James M. Barnett from the Rough Creek area, took care of Pro. Rickard when his health failed until his death. He is buried at Rough Creek Cemetery, which is near Novice. Coleman County Commissioners Court minutes of 1877 list a school called Jim Ned on Jim Ned Creek. In 1877 court minutes mention a Blue Gap School and a John Galloway was the teacher. John Galloway is buried at Atoka. 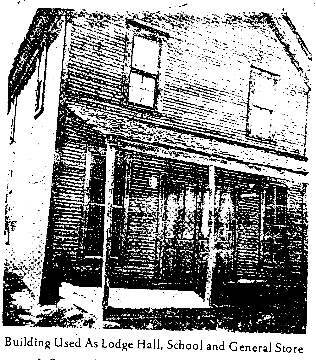 A two story building was moved to Atoka from the Blue Gap area in the late 1870's and was used as a general supply store and Masonic Hall. It is thought this building is the school mentioned in the court minutes. A person who attended the Atoka school, Nat Wright, was interviewed by Jack Shields in Abilene when Nat was 100 years old. At the time Runnels County was under Coleman County for jurisdiction purposes. In the early 1870's the area still had some Indian trouble and there was a Ranger Frontier Battalion under the command of Jeff Maltby, stationed at Indian Peak maintaining a look-out station from 1874 to 1876, to protect the early settlers. There was no town of Content then. Maltby speaks of settlers along Buck Creek, which is just each of Indian Peak. Children from that area went to school at Atoka and/or Jim Ned. Later a school was built at Content and Midway. In 1910 the railroad arrived and Goldsboro was organized with a school being built. Who built the Atoka School? It is thought it was built while the range was still open range. There were some big cattle operators along the Jim Ned Creek and some had line camps with families in them and children of school age. ... thought that Blue Gap, Atoka and/or Jim Ned schools were this type. Blue Gap, which is in Runnels Co. near the Coleman County line, and a few miles west of Atoka, was on the route of a stage line that ran from Georgetown to Buffalo Gap. There was only a small one room log cabin which was used for the post office and passenger stop. It is thought the Blue Gap mentioned in the court minutes was an area which later was called Content, just a short distance north of the cabin.